Scarlet opened his eyes, the feelings of nausea gone, and looked up. The Mysteronised Scarlet stood frozen for a moment, a shocked expression on his face, before falling lifelessly to the floor, his gun skittering away across the floor. 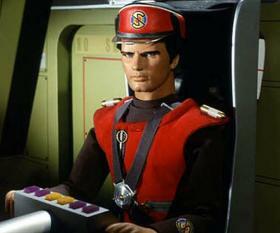 Captain Ochre, smiling broadly, lowered the anti-Mysteron gun. “Lucky I brought this gadget.” he said helping the still shaky Scarlet to his feet. “So that’s why he looked as if he’d seen a ghost.” said Scarlet, lifting the shoulders of his Mysteron counterpart. “There was also the fact,” Ochre added. “That when you left me behind, you weren’t in uniform.” He grabbed the Mysteron’s legs and between them the two officers managed to carry the body into the cloakroom. “Do you know what I’m going to do when we get back to Cloudbase?” Scarlet asked as they struggled with their burden. Once in the cloakroom, they looked for a suitable hiding place for the body. “In there.” Scarlet suggested, pointing to a the half-open door to a cupboard. a dust sheet, and then closed the door. “I think we ought to find the Colonel and the others.” replied Scarlet. “But first,” he added, grabbing an overcoat from a coat-hook and passing it to Ochre, “you’d better make yourself a little less conspicuous.” The coat was large and baggy. So much so that the anti-Mysteron gun and detector could be concealed within it. The Mysteron detector, looking as it did, like a slightly unusual camera which, after all was what it was, Scarlet slung over his shoulder. “So where do we start looking?” asked Ochre as they left the cloakroom. The court-room was empty when they cautiously entered the visitor’s gallery. “Obviously the court’s been adjourned.” said Scarlet. “Let’s try the cells.” suggested Ochre. Fortunately, there was a map of the building on a nearby wall and after only a few seconds they had located the cells. “Hm, that’s very interesting,” commented Ochre, pointing out a feature on the map. “Yes.” agreed Scarlet. “Come on, time’s getting short.” Since it was a Saturday, most of the building was deserted and their footsteps echoed eerily along the corridors. A short flight of stone steps led down to the detention area. The guard yawned and looked at his watch for the umpteenth time. Even though he had only been on duty for an hour, he was bored. There had been excitement this morning, it was true, when the prisoner in blue had tried to escape. “The tranquillising dart should be wearing off about now.” he said to himself. Any further thoughts were forgotten as he heard footsteps approaching. Perhaps the warders had come to take his charges away. The rotten lot hadn’t even offered to bring him back something from the canteen. He was surprised therefore, when a doctor, stethoscope hanging around his neck, and a man wearing an overcoat, obviously too large for him, strode into view. “Open up!” ordered Scarlet briskly. The guard turned to unlock the door then stopped himself. “Do you have some sort of identification, sir?” he challenged hesitantly. “Gee, I’m sorry.” replied the guard, unlocking the door. Captain Blue slowly became aware of faces looking down at him. It took him a moment to recognise them as Colonel White and Destiny Angel. His head ached from the after-effects of the anaesthetic dart. He groaned. “How do you feel, Captain?” asked White, concerned as ever for the welfare of his staff. “You took a great risk, trying to escape,” Destiny said quietly. Before Blue could reply, he was interrupted by the sound of the door being unlocked. Quickly, the two figures were ushered in and the door locked behind them. It was Destiny who first recognised the taller of the two figures beneath his unusual clothing. Blue heard her exclamation of “Captain Scarlet!” That was enough. With a yell of “TRAITOR!” he lunged at the figure, his fingers locking around Scarlet’s throat. Scarlet struggled, but Blue was a man possessed, anger and hatred lending strength. Scarlet was on his knees before the combined strengths of Ochre and White could drag Blue away. They held him firmly as Scarlet, gasping for breath, slowly got to his feet. Despite the circumstances in which they found themselves, the Colonel was still very much in control. His rebuke brought Blue to his senses. He stopped struggling but continued to glare malevolently at Scarlet, gently massaging his sore neck. Destiny, in true Gallic style, stood in front of him and spat in his face. A single tear trickling down her cheek, she turned her back on him. White was furious. “What did you say?” he asked angrily. “There was still time for a Mysteron replica to have been made, ” insisted Blue. “Indeed there WAS a Mysteron copy -” admitted Ochre. “Can you prove this?” asked White. “We left the body in a cloakroom,” replied Ochre. “Well there’s no way of checking whilst we’re under arrest,” sighed White. White noticed the Mysteron Detector, still slung over Scarlet’s shoulder. Carefully, Scarlet eased it off his shoulder and passed it to the Colonel. “Captain Ochre, If you wouldn’t mind…” said White, raising the detector. Ochre stood against the wall as White pressed the button, activating it. After a few seconds, he operated the second lever and a photograph popped up. It was a perfect X-Ray photograph. A Mysteron would have been opaque to X-Rays, the result being a normal portrait photograph of the subject. “It seems that I owe you an apology Captain Ochre.” admitted White. “You too Captain.” he said to Scarlet. “Me too,” admitted a sheepish Blue offering his hand to Scarlet who grasped it warmly. “It’s a terrible thing, suspicion,” he added. “I’m so glad that you are not a traitor,” added Destiny, taking Scarlet’s free hand. White cleared his throat noisily when he noticed this and Destiny let go as if electrified. The Colonel had very strict views on such matters whilst on duty. “Have you come to get us out?” asked Blue. “I think it would be better if I had your report first, Captain,” White said before Scarlet could reply. Ten minutes later, Scarlet and Ochre left the cell, Ochre once more wearing his overcoat. “Is he okay?” asked the guard. needed a lot to keep him going. Sadly, he returned to his solitary vigil. “So what do we do now, Colonel?” asked Blue. At the main doors to the court-room, the two Captains split up, following their respective orders. “Good luck, Captain Ochre.” said Scarlet, before turning on his heel and heading for the cloakroom, in accordance with the Colonel’s plan. With a gentle whirr, the seat lowered to the ground. Ochre prepared to strap himself in when he became aware of a buzz past his ear. A moment later, he heard the crack of the guard’s rifle. The guard had adopted a kneeling position, his rifle in the firing position. Quickly, the hatch closed as, with a whine, the next bullet ricocheted from the metal of the S.P.V. learned that the Colonel and the others were not yet safe. However, he set his personal feelings aside as he received his instructions from Captain Ochre. “I have all that,” he told Ochre. He closed the channel and opened another to Geneva Hospital. “Well, do you have a number to contact him?” asked Green. She thought for a moment. Hospital rules were strict on that matter… yet the young man’s voice held a note of sincerity that she found impossible to refuse. Green thanked her hurriedly then made the call. The alarm clock sat mute on the bedside locker, having long ago rung to exhaustion. Beside it sat an long-forgotten cup of tea, a deep brown skin floating on the by-now cold surface of the liquid. The only sound in the room was that of muffled snoring emanating from somewhere under the blankets on the bed. The telephone, an antique model with a bell, jangled noisily. It finally succeeded where the alarm had previously failed. With a faint groan, the huddled form moved slightly. A lone hand worked its way out of the cocoon of blankets and groped for the receiver. The fingers touched and then grasped. The arm withdrew, the handset drawing the coiled cable behind it. “Yes, What is it?” the muffled voice said sleepily into the telephone. There was a pause as the caller explained what he wanted. “What!” Doctor Harvey sat bolt upright. The telephone flex, already straightened out by the distance it had travelled, was suddenly pulled taut, flicking the teacup onto the floor. “Thank you, sir,” replied Green, closing the channel. Captain Ochre’s epaulettes flashed green. “Go ahead Lieutenant,” Ochre said as the Cap Microphone dropped into place. Harvey stood up, put his feet into his slippers and then winced. The tea he’d spilt had managed to land in one of them. Slowly, he removed the offending slipper and up-ended it into the cup. “It’s going to be one of THOSE days,” he said to himself as a thin stream of brown liquid trickled into the cup. He put the slipper down once more and barefoot, went to his room to dress. He’d been right. His wife hadn’t understood. She’d banished him to the spare room. On the other hand, she had brought him his tea this morning, so perhaps she hadn’t been as angry as she’d made out. Captain Ochre arrived ten minutes later, the S. P. V crunching noisily up the gravel drive to the doctor’s house. Harvey was more than a little surprised. He’d been expecting a jeep or some kind of saloon. He was even more surprised to find that he was expected to sit facing the rear of his strange looking vehicle. Still, he was prepared to try anything once. With the banging of the gavel, the babble of voices was silenced. The assembled court rose as Kemsley once more entered the chamber. “For all the good It’s going to do us, ” muttered Blue to himself as Colonel White rose slowly to his feet. “Colonel White.” Kemsley’s voice was like ice. “Since you persist with this ridiculous fantasy about aliens, It is clear that your evidence is inadmissible. You may stand down.” There was a murmur from the gallery. “With respect, sir…” began White. The foreman of the Jury rose to speak, a worried frown upon his face. A short, greying man in his fifties, who had served once before as a juryman, many years before, something about the day’s proceedings worried him. “Yes, yes, what is it?” snapped Kemsley testily. above agreed with him. Soon, it had increased in volume, with “Quite right too.” and “Let him be heard,” flying across the chamber. “Silence!” Kemsley roared, smashing his gavel down on its block. Calmly, White rose once more to his feet. “Surely, there can be no harm in the truth,” he said looking straight at Kemsley. “If this is a fair hearing.” There was a note of challenge in his voice. The Jury murmured its agreement. Moments later, Harvey was ushered in, briefcase in hand, a shock of tousled hair betraying his hurried journey. “That is correct, yes,” replied Harvey. “Exactly which poison was used?” asked White. “Thank you, doctor.” Harvey smiled as he stepped down from the witness box. Kemsley glowered at White, but knew that there was nothing, as yet, he could do. Briefly, Blue covered the events leading up to the meeting with Johanssen then, in greater detail, described the events on Cloudbase. “…we finally trapped him behind a power conduit,” finished Blue. “What was the result of this action?” asked White. “What happened to Captain Scarlet?” asked White. “I guess he must have been blown out by the decompression,” replied Blue. “We found his body several miles away. “Is this relevant?” snapped Kemsley. “Are you saying that they had been brought back to life?” The foreman was rather confused on this point. “This is ridiculous!” retorted Kemsley. Kemsley turned on him. “Do you presume to tell me how to conduct this trial?” he snapped angrily. “N-No sir,” was the nervous reply. Quaking, the unfortunate Clerk returned to his seat. There was no doubt about it, the old boy was becoming decidedly arrogant. His wife and children must be going through hell, the Clerk thought to himself. The foreman thought for a moment, then sat down. The other members of the Jury gathered around him. After several tense moments of muttered discussion, the Jury returned to their seats. The foreman stood once more. “Your Honour,” he began. “We agree with the Clerk of the Court. We do not feel that we can come to a just and fair verdict unless we hear everything that the Colonel has to say.” He sat down amidst a round of applause from the Visitor’s Gallery. Grayson frowned. It was proving to be more difficult than he’d expected. He consoled himself with the thought that his enemies’ fate was already sealed. Try as they might, there would be no escape for them. Colonel White continued. “As I was saying, Captain Scarlet was killed in the car crash. The Mysterons created a double of him, which they used to kidnap the World President.” He then went on to describe the gun-battle at the top of the London Car-Vu and the subsequent events. The members of the Jury looked incredulous at the fantastic story that was being told. Grayson saw the expressions and relaxed, White was signing his own death sentence. His smile grew broader as White finished his narrative. The atmosphere was electric as the panelled door opened to admit Scarlet. The figure moved to take his place in the witness box. “Yes sir,” replied Scarlet. He told the Court of the events leading up to the search and subsequent discovery of Johanssen’s body. “What happened then?” asked White. At that moment, there was a faint cry from the body of the court and a figure stood up. “But you were left for me to…” said Harvey, pointing at Scarlet. “I er, that is. No, I must be mistaken,” stammered the doctor. Again, the doctor nodded “I thought that someone had moved it,” he said quietly. He stared at Scarlet and shook his head slowly. “He appears to be, ” replied Harvey carefully. He could be locked up in a padded cell for less. “And the body was dead?” asked White. White ignored him. “What was the presumed cause of death?” he continued. Gratefully, Harvey returned to his seat. “The evidence is inadmissible,” snapped Kemsley. “He was not in the witness box.” Captain Blue groaned. The smile had disappeared from Grayson’s face. He had the first faint feelings that something, somewhere, had gone wrong.